The Hive tells the story of a young man named Adam (Gabriel Basso), who wakes up in a filthy secluded cabin not knowing who he is, how he got where he is, and has to figure out how to save Katie (Kathryn Prescott), the girl he loves. The film plays out like Memento mixing flashbacks and the present as Adam has to put the pieces together from the clues he's left himself to figure out what is going on. We find out early on that a virus has infected him, Katie, and the human race that essentially takes over the mind and plugs it into one giant collective thought machine, creating a zombie/drone like race. It's a hefty storyline for sure and The Hive offers something to say about the world being constantly plugged in and online with a growing addiction to social media. One pivotal scene in the film even hits it on the nose as a character explains the possibility for humans to share thoughts directly from mind to mind in what he calls, “the ultimate social network”. There's a lot of respect that must be given to a film that attempts to tackle such cultural issues in a creative and symbolic way, and The Hive certainly has that going for it. Another success of the film is it stylistic look and remarkable make up effects. The film is edited with constant quick cuts that make for a relatively fast pace and creates a sense of urgency for the main character to fight against. The quick cuts can also get a bit distracting after a while as it almost feels like there's more to keep track of in the film than is actually being presented. The make up and practical effects here are simply beautifully done. It's very reminiscent of the look Evil Dead (2014) had; very brutal and detailed as the virus infects the people. The lighting also emphasizes the make up with a very bleak and sterile look that makes the random blacks and reds on people's bodies really stand out. One problem the film runs into is there are scenes that are dialogue heavy to explain what is going on and to connect the film together that seem longer than they are because they are surrounded by such quick cuts in the other scenes. I also felt that there was a bit too much explanation needed to make the lofty premise make sense to the viewer. Perhaps what really saves The Hive, along with the appearance of the film and effects, are the performances from the entire cast. The film doesn't call for a one man show from Gabriel Basso but it does essentially rest on his shoulders and he does a solid job here. He is able to successfully portray a wide range of emotion and also comes across as likeable and relate-able with an everyman vibe. Kathryn Prescott also does a good job in her role and Gabrielle Walsh does fascinating and chilling work with her eyes and face as the doomed Jess. 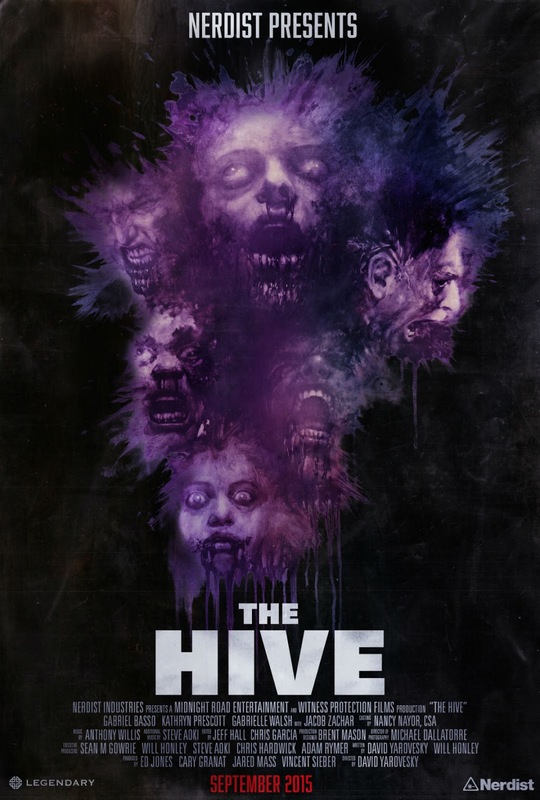 While I didn't love The Hive as much as I wanted to, I did find it to be a pretty decent horror flick with amazing effects and solid performances. It also has something to say as a reflection of our social media obsessed and constant thought sharing culture. That's enough for me to see what writer/director David Yarovesky does next.